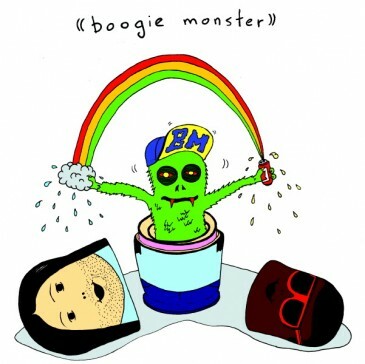 The name Boogie Monster may suggest beefy funked out dance parties ripe with horn sections and DJ’s scratchin’, but you ought not to judge a book by its cover. These words certainly can describe the band, both in the musical department and how they play. Though the music can be crazed and massive in sound as Fussell pulls complex chunky riffs from his guitar and Tony Dallas’ ridiculous, energetic drumming style constantly threatens to blow the house down, there is a light-hearted and humorous quality to the music. It really is like watching a couple of wild cartoon children letting loose with musical instruments. With influences steeped in the post-rock and ambient noise genre, bands such as Godspeed You! Black Emperor and avant-garde guitarist and composer Glenn Branca play a role in Boogie Monster’s ambient guitar and drum-heavy sound. Along with Rage Against the Machine’s guitarist Tom Morello who inspired Fussell to pick up a guitar, it was At the Drive-In that helped to shape what Fussell wanted in a band. 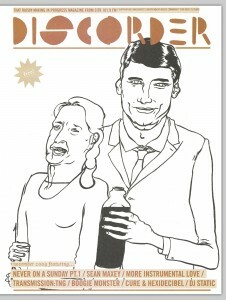 Formed in 2007, Boogie Monster didn’t actually play their first live gig until January of 2008. Soon after that gig, then drummer Owen Lewis had to leave Vancouver in April for university, which sent Fussell on the hunt for a replacement. Enter Tony Dallas, who came highly recommended from the SSRIs, a band he had previously played with and who Fussell had seen at various shows around town. After checking out a Boogie Monster show in March at the Astoria, Dallas was down for trying out. And during that first audition it was clear that he was a sure fit. With a CD in the works over November and due out in December followed by a West Coast tour, as well as a good string of appearances in town and at festivals such as Music Waste and Pop Montreal, it seems that Boogie Monster is hitting its stride with audiences. Even if they don’t know what to make of the music they still find themselves appreciating it.